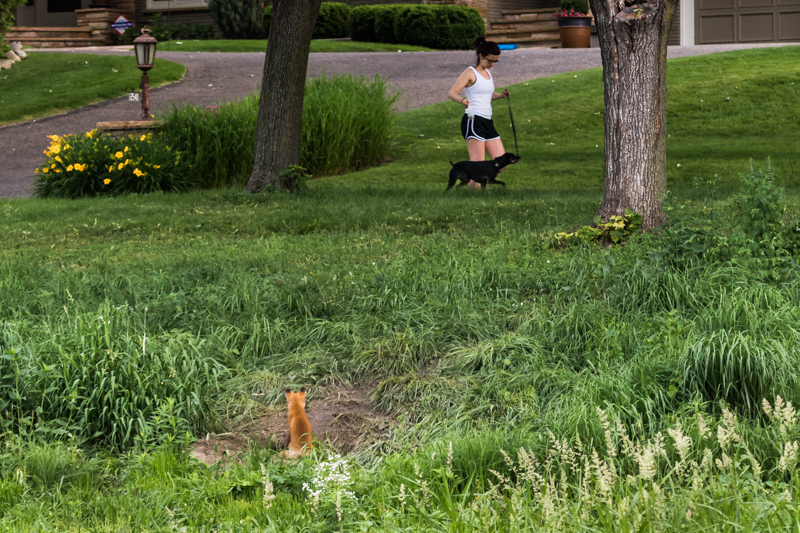 The red fox family that occasionally visits my backyard has moved on apparently, but a friend reported a fox family with three kits in her Minneapolis neighborhood, so I went over to investigate. Sure enough, at least one of the kits was still sleeping in the den when we arrive at 6:30 a.m. This was actually shot quite a ways away across a pond with my 400 mm lens. 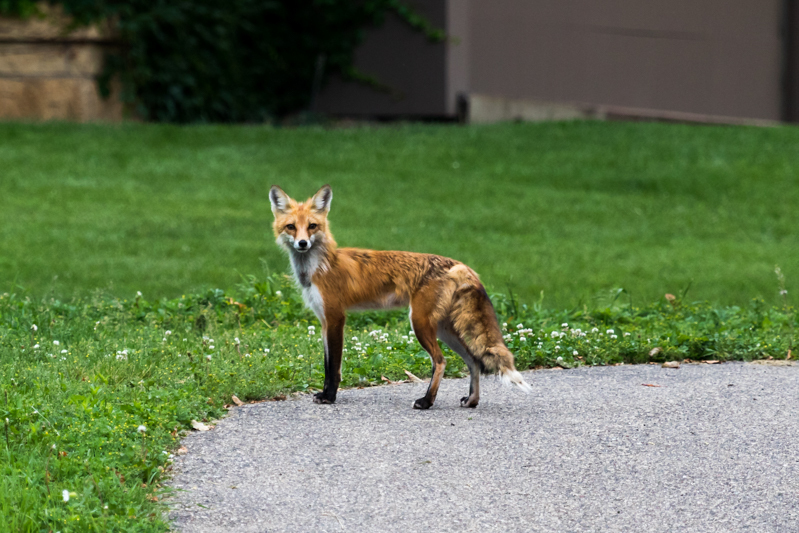 Red Foxes are seen more frequently in urban environments these days, as are a variety of other predators — e.g., Great horned Owls, coyotes, and Sharp-shinned Hawks (that specialize on birds coming to feeders). The urban environment offers a plethora of hiding places, a variety of freshly discarded garbage (and foxes are quite omnivorous), and a human population that usually tolerates their presence, or perhaps even cultivates it. Even the presence of dogs fails to drive foxes away, but they are definitely wary of their canine relatives. The fox den (at bottom right of the brown scrape in the hillside) is hidden from the view of pedestrians and their canine friends on this particular hillside overlooking the pond. The fox is alert, ready to dash back down the front door of its den, but there is no need for that when dogs are on leashes. One of the adults was checking for treats at the houses across the street from the den. It stopped on the driveway to check us out. 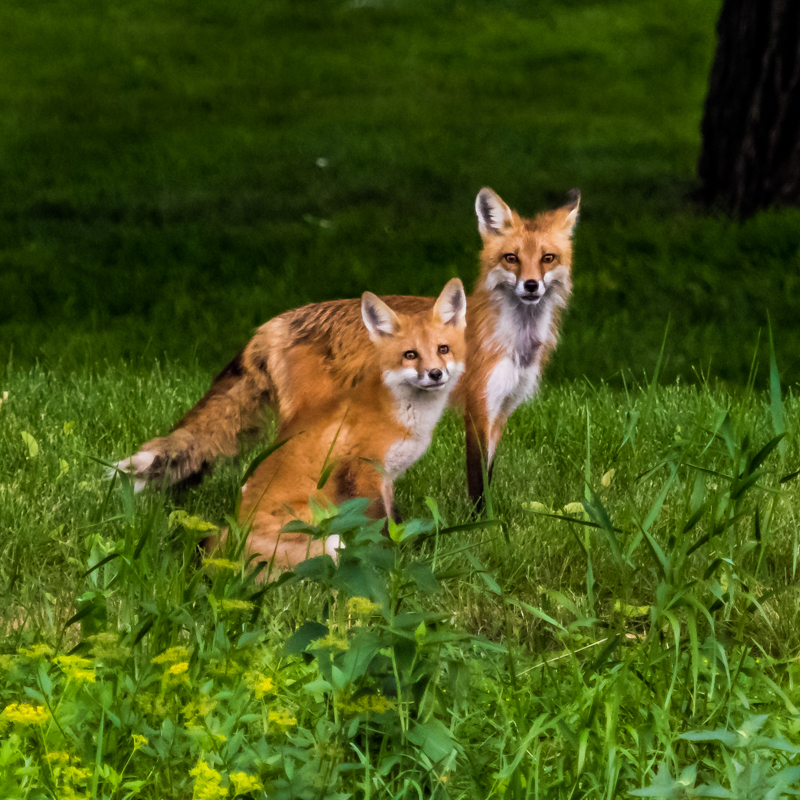 Unlike many species, red foxes can survive quite nicely in the fragmented habitat of the urban ecosystem, where parks and woods are interspersed with houses. 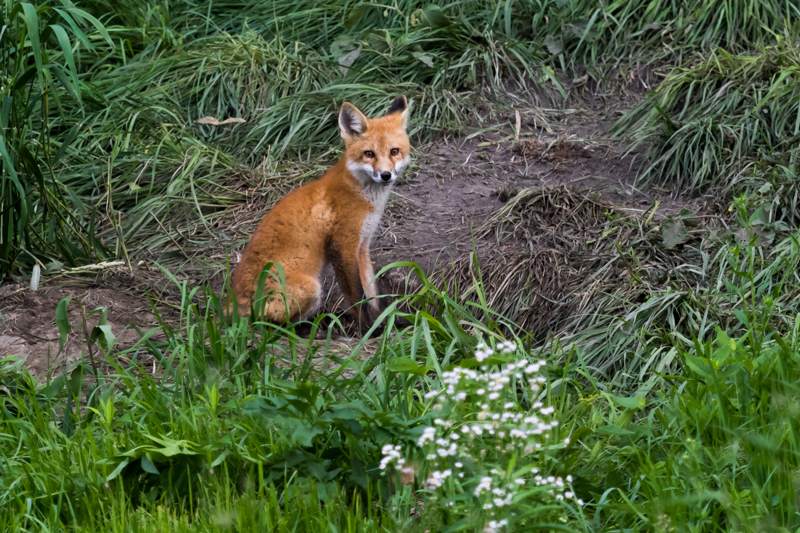 Even without the greater acreage of the local park, foxes find plenty of squirrels, mice, and rabbits in our backyards, and do us a service by reducing the numbers of those wildflower-consuming herbivores. 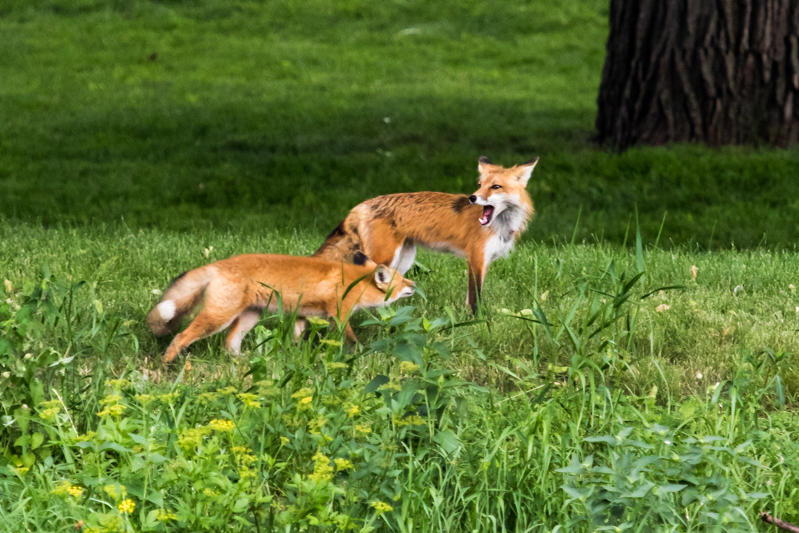 In fact, because of their flexible diet and adaptable hunting behavior, foxes are one of the best rodent population controls we have in the urban environment, and they don’t kill small songbirds like house cats do. I’m not sure what this greeting by the adult meant, but notice the submissive (head down, ears back) posture of the kit as it approaches. These kits (I think there three of them in this family) were probably born in this or another nearby den in March or early April. They mature quickly, are ready to hunt with their parents by mid-May, and will stay with the family unit until they reach reproductive readiness this winter. Ah– a family portrait. Maybe I’ll be able to see the rest of the family on a return trip sometime. 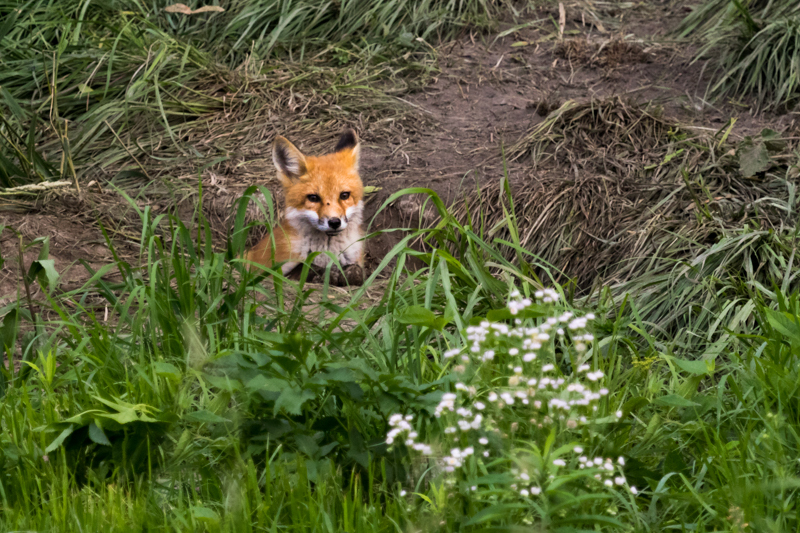 This entry was posted in Behavior, Gardens, Mammals, Minnesota wildlife, Nature, spring, Wetlands and tagged adaptable species, Red fox, urban ecosystem, urban fox by Sue. Bookmark the permalink. GREAT photos! Love the family portrait. Thanks, Jacy! I’m glad you’re enjoying the blog. Enjoyed the pictures. The foxes under our barn left a long time ago and groundhogs replaced them. Foxes are more entertaining. That is a lot to think about. We’ve had both every year and neither stayed, until this year. Foxes are more entertaining. The last photo is exceptional! Thanks, Montucky! That’s quite a compliment from such a wonderful photographer as yourself. Beautiful shots, Sue, of some gorgeous foxes. It’s amazing that they live in urban areas, but you did a wonderful job explaining why and how that is possible. Thanks, Mike. Unfortunately, not enough people feel like the foxes belong in the urban environment, and they still put out poisoned food. One of the foxes in that area got shot — right in the city of Minneapolis, which is, of course illegal.